Visitors to Glasgow will be spoilt for choice when shopping in The Merchant City. The area is teeming with shops, selling everything from vintage vinyl to luxury underwear to glass beads and jewellery. There are comic book stores, florists, arts & crafts boutiques and design emporia to name but a few. Designer clothing and accessories from names such as Ralph Lauren, Agent Provocateur, Replay, United Colors of Benetton, Emporio Armani and Mulberry. Not to mention the Merchant City Market for some handmade treasures and Brittania Panopticon Shops for recycled furniture and vintage clothing. There is also a plethora of caf�s, bars and restaurants when the time comes to take a break from the shopping trail. One day just isn't enough to get the most of out the Merchant City shopping experience. 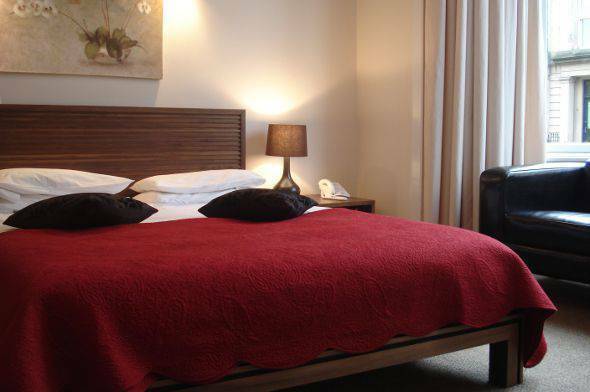 Staying at The Sandyford Hotel is an obvious choice when looking for cheap B&B accommodation near The Merchant City. Our 3* hotel is conveniently located between the City Centre and the West End of Glasgow, with 55 comfortable and affordable rooms in which to rest after a day of retail therapy. Our bed and breakfast rates include a full Scottish breakfast and there is a member of staff available 24 hours a day to help with any problems. Why not plan a trip to Glasgow for some Merchant City shopping today. We will be delighted to answer your call on (+44) 0131 314 0000 and advise you on the availability of rooms for your preferred dates of travel. Alternatively you can make an online reservation with the aid of the booking form on this website. Make The Sandyford Hotel your base for a shopping trip to The Merchant City in Glasgow.